Beautiful well-crafted home and lovely gardens. Everything you need to cook a nice meal! Kitchen view looking at entrance way. Artist Getaway...Great views and flora to paint! 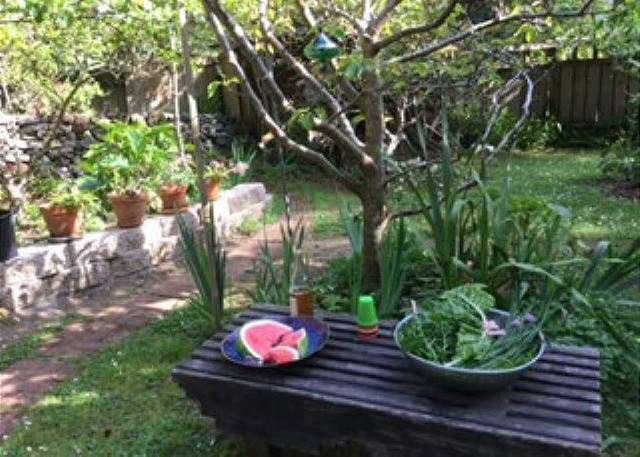 Great gardens with fruit trees, native plants and hammock. West of Haven is secluded and in its own beautiful environment lending itself to sheer relaxation. 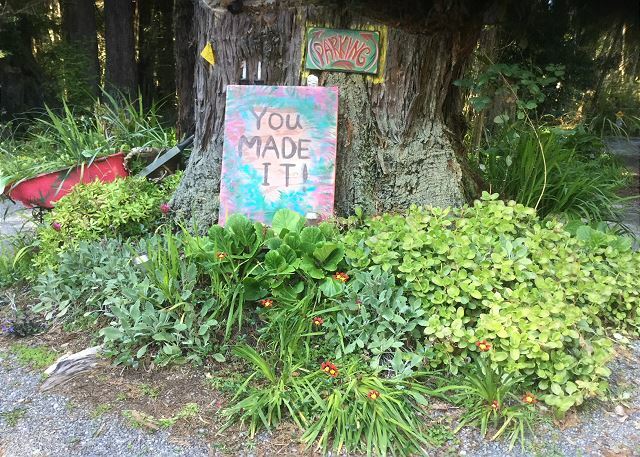 ‘Magical’ is often the response from past guests upon arrival to this custom, hand built home nestled in the giant redwoods with private yard and beautiful gardens. Many walking trails meander through the woods including a mile and a half walk to Moonstone Beach. 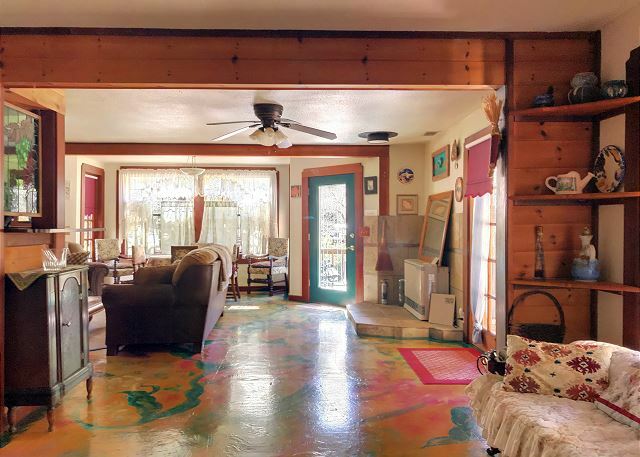 This quaint, lovely and unique artist home features custom woods and original floor art. Most of the wall art are original oil paintings by Kahish. The sculpted garden has flowers and fruit trees worked by Ottavio, an Italian Native. 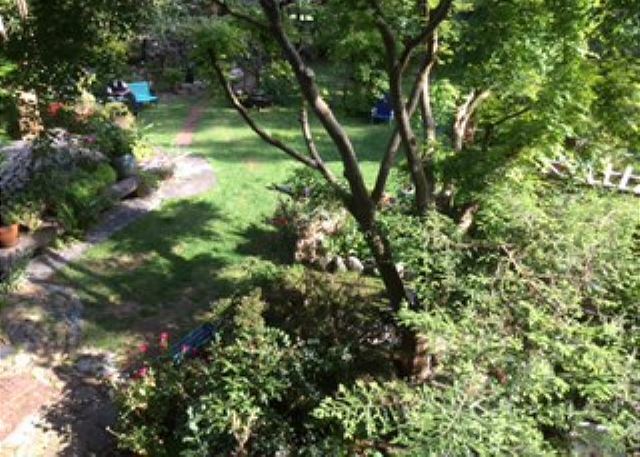 You may be inspired to bask near the Japanese maple with the gentle Humboldt breeze soothing your inner being. Most travelers like to go hiking in the redwoods at the nearby state parks along the coast or on the many private trails. The birds often serenade in the morning. They may inspire you to play the family piano once owned by the 22nd Governor of California, James Gillette at the turn of the century. Nestled in the giant redwoods at the end of a private lane. 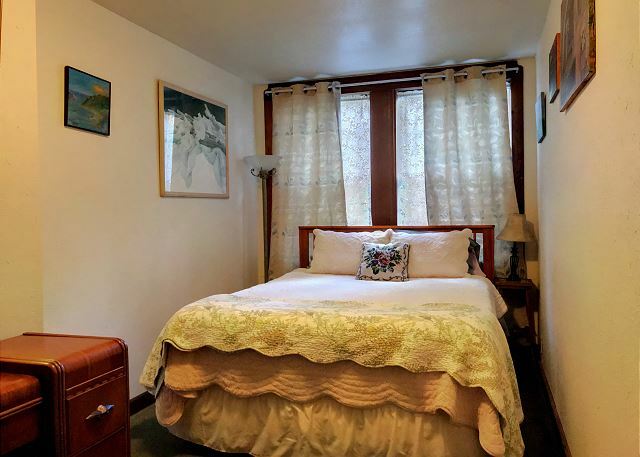 Lovely downstairs, 2 bedroom with a queen bed in each, 1 bath (with claw foot tub & bidet), nice kitchen, living room (with sleeper sofa) & dining room with custom woods and original floor art. 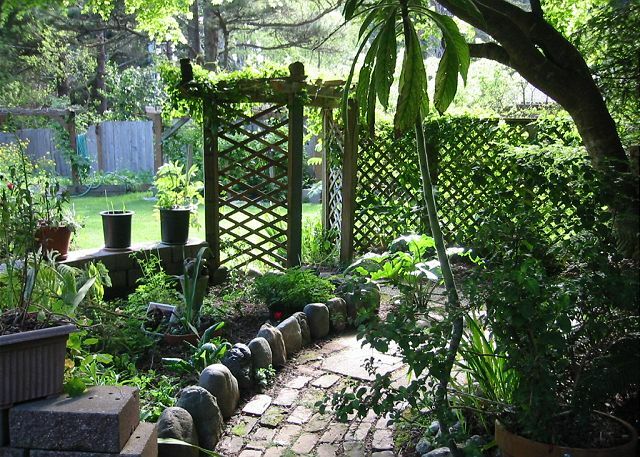 West of Haven Redwood Retreat awaits your presence in a tranquil relaxing garden setting. The owner, Ottavio, live upstairs in separate unit part time and travel and live also in Italy and in the Yucatan in Mexico. He may be there seasonally which will only enhance your experience as they are sure to share a gift with you as he owned and operated successful restaurants in the area as well as an organic farm and vineyard. The West of haven is one of our unique homes. The homeowners take much care with this home from the select themed furniture, to their artistic influences, down to their time and care of the yard and garden, this place is just special. I am so glad you appreciated the home and the location and I hope your visit to the redwoods was one to remember. we loved the place. we had two dogs, a lab and Australian shepherd. they were totally fine in the yard, lots of room to move. the house is warm and cozy, the beds are comfortable, the kitchen has everything you need to cook. we would have liked to try the pizza oven outside but never did. great artwork through out, a piano to play, lots of books to read, and the yard is amazing with all different kinds of plants, truly amazing. no wind, so close to the moonstone grill and beach. try it out. Thanks for the nice review of the West of Haven Home. This is a very unique property, well maintained and artistically looked after by the homeowners. Close to beaches and the redwoods, it is a prefect place to stay when visiting our coast. Please look us up at Redwood Coast Vacation Rentals when planning to visit this way again; we would to accommodate you. This home is very comfortable....a home away from home. Our only negative to share is that they were having a new roof put on and didn’t warn us ahead of time. It was very loud all day. We weren’t able to rest and take naps. Thank you for renting the West of haven home. This is a very comfortable home, tucked away in a lush and beautiful environment, off the beaten path, yet close to the beaches and highway. We do apologize that there were workers working at the home, and due to your booking last minute, same day, we didn't have much chance to get the information over to you. Under the circumstances, we would have been happy to grant a cancellation so that you would have been able to find different accommodations, but we were under the impression that you were okay with the work going on, after speaking with the homeowner directly. Again, no discomfort was intended, as we were also put in the position of having to get the roof completed, which was taking a bit longer than were initially informed. We do hope you will give this home another chance in the future, as it is really quite peaceful and serene here. Loved, loved, loved this artistic and vintage inspired home. Plus the garden is absolutely beautiful! The hosts were gracious, the home was comfortable with all we needed to cook our meals (if desired) and the setting amongst trees and clean air, will bring us back again! Such a beautiful spot on the coast. The inside was warm and cozy and the outdoor gardens magical! The hosts were very friendly and I will be back! Thank you for the review of the West of Haven home, Valerie. I am not sure there is much more I could add, other than We cannot wait to have you back! We stayed here for two nights and really enjoyed this house. It's got great character with the necessary modern updates. The gardens and surrounding area are beautiful and driving up the coast is amazing. Thank you! The West of Haven is a unique home with in beautiful setting. There is so much character inside and out, and the gardens are amazing, especially right now with everything blooming. The homeowners are very artistic and it shows throughout the home and property. Thank you for enjoying this home and appreciating what it has to offer. We had a wonderful stay at the West of Haven house. Beautifully furnished, with thoughtful touches, a well-stocked kitchen, and a beautiful garden. It's obvious that the owners take pride in their property. We can't wait to stay here again! Thank you for the review of the West of haven house. I am so pleased to hear that you had a wonderful stay and thank you for taking the time to notice how much pride the homeowners take in their home. They are lovely people, who care deeply, not only about their home, but of their guests' experience and comfort. We definitely hope you will return to stay with us again soon; we look forward to having you back! We are three Master Gardeners from Oregon and we're amazed with the beautiful gardens. So much in bloom that we haven't even seen on the Oregon coast. The gardens at the West of Haven are beautiful. It means so much that they are appreciated by fellow gardeners, as the owners of the home take much care and delight of their yard. This home is very unique in its environment, and in comparison to our other homes, due to the lush environment. We thank you for your recent stay and do hope you will return to visit us again. We took the grandkids on a family getaway for Spring Break. They loved everything about the place: the garden, the piano, the art, and the views of Redwoods. It was cozy at night and pretty in the mornings. Close to Trinidad town and many beautiful State parks and beaches, yet private and secluded from the hustle and bustle. Would recommend for those who appreciate art, quiet and nature. A lovely place. The West of Haven home is a unique and enchanting home. Loved reading that the grandkids loved everything about the place. Being close to Trinidad and the State Parks makes this a nice home to return to, with all the art and nature surrounding. Glad you enjoyed your time and thank you for choosing this place for your vacation home. Unique and beautiful place but no privacy. This property was unique, lots of art and antique furniture plus nice amenities. Yard was pretty and well cared for. The only drawback was a tenants in the upstairs apartment. They were quiet but the fact that they were there and could look down on you if you were out in the backyard made it a less than private experience. Thank you for your recent stay at the West of Haven home. Sorry to hear that you felt a lack of privacy. As this home is advertised as a split level home with the owners living upstairs, may I recommend a home with no other tenants for any future stay. The owners here are actually very aware of guests and tend to go to extremes to not violate any guests privacy, so I do hope your stay was otherwise enjoyable. We had a wonderful, Relaxing 3-day stay at West Of Haven. 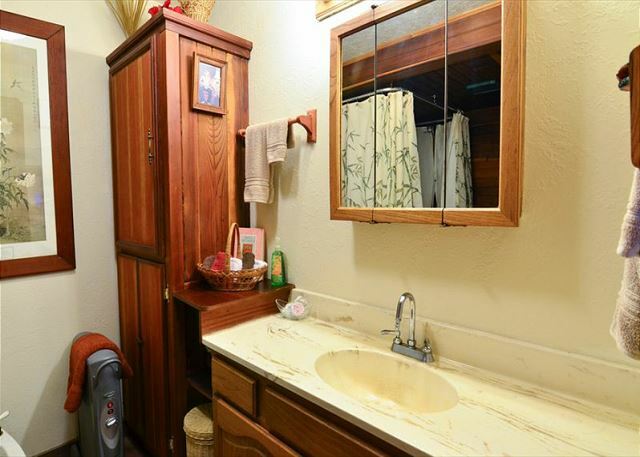 The house was very clean and comfortable, my husband enjoyed playing the piano and I enjoyed taking a relaxing bubble bath in the claw foot tub. The garden and flowers were beautiful and the location was very close to the beach and shops and restaurants. We would definitely stay again! You're the first guest we have had that has mentioned the piano; that just made my day. I am so pleased that you enjoyed the West of Haven home. It is definitely a unique home with a lot of special touches added by the owners. Thank you for choosing this home and we look forward to your return visit. Lovely, comfortable, pleasantly different, peaceful. Of the places we stayed while doing a road trip along the Oregon-Northern CA coast this was the favorite of the French couple with whom we were traveling--we were very pleased as well. Thank you for choosing the West of Haven. This home is off the beaten path but has much charm. It always brings me pleasure to know the home was enjoyed, and we hope you had a beautiful journey forward. 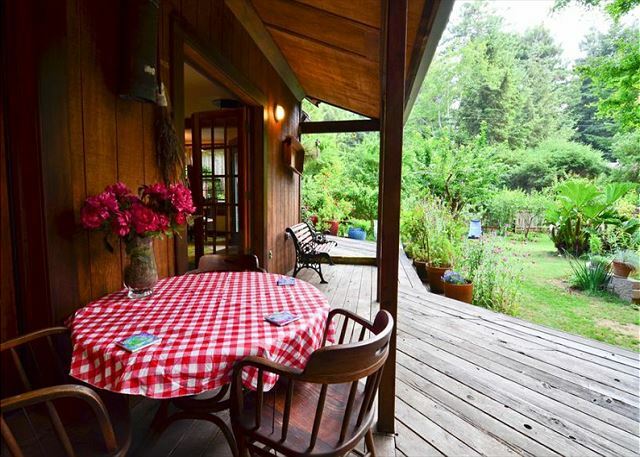 The property was perfect for our four-night family get-together as we did two Trinidad beach jaunts, area blackberry-picking, at-home relaxing, meal cooking, Scrabble-playing and a last-night outing to the Trinidad Bay Art & Music Festival. Unfortunately, we forgot to write a message to the owners in their guest log. This lovely couple have nurtured a beautiful retreat setting, provided a few welcome goodies during our stay and visited with us during a laid-back afternoon in their most lovely garden. We so appreciate our stay in their lovely home. Please pass along our grateful thanks to them. Thank you for your kind review and it will definitely be passed on to the owners of the home. They are such wonderful and artistic people and it really shows in their home and in their gardens. They will will be overjoyed to hear of your good time while staying there. Again, thank you for your stay, and we hope you will return again some day. What a beautiful place to spend our time while visiting the Redwood Forest area. The house and gardens were charming. The owners and neighbors were friendly. The town of Trinidad nearby was very convenient with a grocery store, shops, cafe and beaches. We could not have been luckier to find such a wonderful, peaceful location. The West of Haven is definitely one of our most charming homes, nestled away in a wooded area with beautiful gardens and flowers. It is off the beaten path enough to feel private, yet so close to the beaches, towns, and highway to get to the Redwood Forest. Thank you for renting with Redwood Coast Vacation Rentals and we hope we can accommodate you again in the future. We had a great time staying here! It was a very cute home with beautiful surroundings. Glad to hear that you had a great time at the West of Haven Home, we hope we can accommodate you again soon. Great location for quiet and relaxing at the home. Immaculately clean. Kitchen well stocked and allowed us to make nice dinners every evening. Nice living room and dining area that worked great for playing games and enjoying meals as a multi-generational family. One small thing is that I didn't pay attention to the fact that the shower was one of the tube-types within a claw foot tub. My elderly folks were not able to take any showers for the four days we stayed. Location fairly isolated and does not allow you to walk to any amenities. West of Haven house is a great home for those seeking a place near the beaches and off the beaten path. I am glad to hear the home was a relaxing place for you, with exception that the shower setup was not accommodating to your needs. When booking with Redwood Coast Vacation Rentals, please call our Reservations in advance to ensure the home is the right fit for the guests during your stay. Thank you again for choosing RCVR, and we do hope you will return to stay with us again. This is a most wonderful vacation experience. Beautiful house and garden nestled in the redwoods. Clean and comfy! The West of Haven home is such a magical place, I am pleased to hear that you had a wonderful vacation experience. Thank you for choosing our home and we hope we can accommodate you again in the future. The house was beautiful, and we had a very comfortable and restful stay. Kahish was lovely, and we enjoyed talking with her. I loved the garden and hope to come back when things are in full bloom. The house was really beautiful, and spotless. The West of Haven is a beautiful place to stay. What a treat you were able to meet the homeowner, they are lovely people. 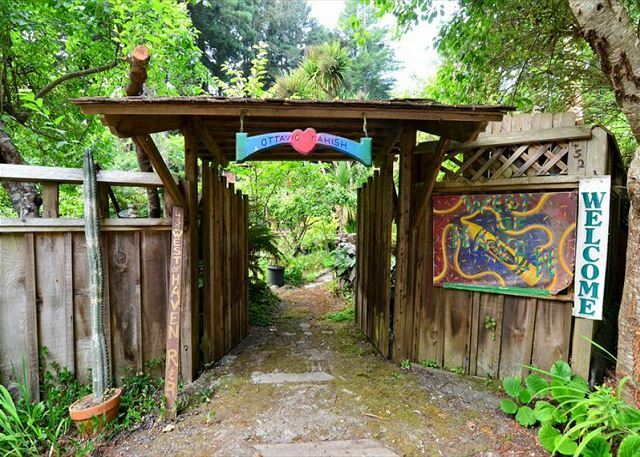 This is a wonder home off the beaten path with a magical garden area; one of my favorites. Thank you for booking with Redwood Coast Vacation rentals and we hope we will be able to accommodate you again in the future. We are a family with two teens. We enjoyed the house after hotel stays, and really appreciated the naan bread and juice waiting for us on arrival. We especially appreciated being able to bring our dog along, and we all enjoyed nearby adventures to Moonstone Beach and the redwood forests. Thank you for a wonderful stay! Thank you for your recent stay at the West of haven. We will pass on your appreciation for the homeowners' treat they left for you. Like you, I enjoy the comfort of having my dog with me, so I am pleased to hear this home was a good fit for you and your family. Please visit us again when visiting the beautiful north coast. Was all around gorgeous and a nice place to stay. Only complaint is i thought i would be more comfertable with the owners there but it was slightly awkward, you could hear everything on both ends. I would absolutly go again if i knew we would be alone. Thank you for your review of the West of Haven home. It is a beautiful and lovely place for a getaway off the beaten path. Here at Redwood Coast Vacation Rentals, we have many types of accommodations and in the future, please give us a call directly so that we may better help match you to the home that would be a perfect fit for you and your needs. Thank you again for staying with us and we hope you will return to beautiful Trinidad again for another occasion. So glad to hear you enjoyed your time here at the West of Haven home. Such a wonderful place with a fabulous yard, so glad you loved it. We can't wait to have you back again! We really loved your place, was so cozy and felt just like home. The home was decorated just perfect and loved the yard too. Had a sister and her guy over for cocktails before going out to dinner. They loved it too. Thanks to our friends who told us about this wonderful get-a-way. Would recommend it to all our friends. Thank you for choosing the West of Haven home for your Humboldt Get-away. This home is off the beaten path and somewhat nestled in a forest environment for those looking to enjoy nature and a few days outside of the city. The owners have spent much time on the details of the home decor and garden, so thank you for noticing and appreciating this. Good to hear you heard about this home by recommendation and we hope you will return to stay with us again. The pictures and rental description had us hooked from the get-go and lived up to our expectations. The peaceful manicured gardens with all it's nooks and crannies became our heavenly haven following days adventures. Owners Otavio and Kahish were gracias hosts and we're most grateful for their sharing of their healing sanctuary with us. West of Haven is such a gem and tranquil place. The owners have put put much heart into making this place such a haven for their guests. Thank you for staying with us and we hope you will visit again. We'd hoped the home would live up to the advert on the web site and frankly, it surpassed it. 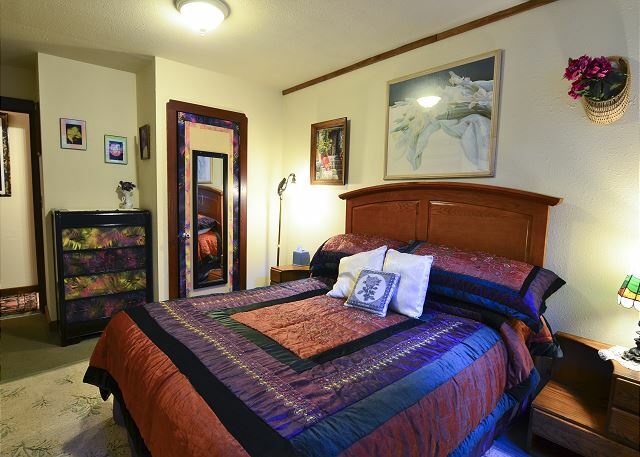 Great location, beautiful surroundings, comfortable, clean quarters - one of the nicest places we've ever rented. Everything was super clean and welcoming (kudos to your cleaning people - they are doing an excellent job). 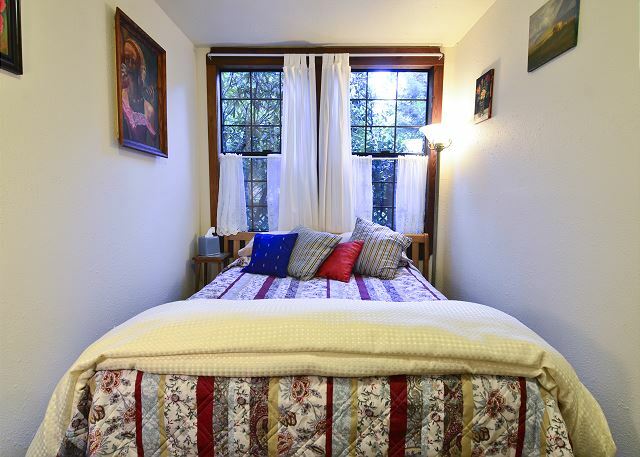 The beds were comfortable, the kitchen beyond well-stocked, and the house full of character and Northern CA charm. And the garden - Wow. We spent a lot of time there because it was so soothing and peaceful, with the redwoods all around us, and all the artistic touches of arbors and art work co-mingled. This is definitely a place you want to visit. And come back to again and again. Thanks so much for letting us enjoy this wonderful home. What a wonderful review of the West of haven home. Your description about nails it! Such an artistic home with such comforts, really makes this place a wonderful and relaxing place to be. You are here at such a perfect time for the garden, too. So lucky! Thank you for renting with Redwood Coast Vacation Rentals and we definitely hope we will see you again. 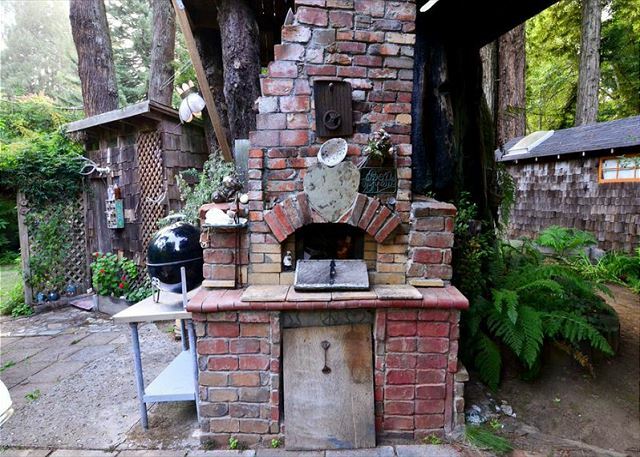 a wonderful hideaway surrounded by gardens in the midst of a spectacular redwood forest. Kahish and Ottavio are lovely people- thanks for sharing your beautiful home with us!. Minutes from soectacular Trinidad. Truly a "back to nature" experience. Highly recommended! West of Haven is something special! Happy to hear you enjoyed your time at this lovely home and that you had the opportunity to meet the owners. They are very kind and generous people; they will definitely make you feel at home. Off the beaten path, one can truly feel with nature at this home. Thank you for booking this home for your vacation and please visit again soon. Our family loved staying at this charming little house in the Redwoods. It felt like home away from home. West of Haven is definitely a home away from home. thank you for you choosing this place as your vacation home and please visit us again. We met some old friends for a few days of hiking and long talks. We were enchanted by the setting, the garden, the big trees, and the friendliness of the owners. West of Haven is an enchanting, special place. Thank you for choosing this home for your vacation while meeting up with friends. We thank you for choosing Redwood Coast Vacation Rentals and hope you will return to visit again on another trip. The house is a rustic in the woods house that is wonderfully set in the woods. No traffic, Quiet, It was great to walk each morning and evening and listen to the birds and woods. The beach is a short less than five minute drive and sunrises and sunsets scenes are awesome. I am pleased you found West of Haven to be a quiet and relaxing place. The environment there is such a treat, and the quick drive to the beach is a plus! Thank you for booking with Redwood Coast Vacation Rentals and please stay with us again. Quiet and peaceful in a beautiful setting, that is how I would describe West of Haven. The house was charming and the gardens were lovely. We were even greeted by fresh cherries, homemade bread and jam. The kitchen was even stocked with anything I could have ever needed to cook with. (Which was perfect as I have food allergies which makes eating out a bit more difficult.) I would definitely come back, although I would plan to stay longer. West of Haven is quite the "home away from home." What a wonderful review of the West of Haven. The owners of this lovely home are quite hospitable; I am glad you had the opportunity to delight in their homemade treats. As they are people who love to cook, I am pleased you were happy with their stocked kitchen. "Home away from home" is a perfect description of this rental. Thank you for booking with Redwood Coast Vacation Rentals; I do hope you will get a chance to stay here with us again. Spent my birthday weekend at this wonderful house with awesome friends. Loved the personal touches, the cut flowers, the orange juice in the fridge and the fresh eggs! The house and the yard........beautiful! So glad to hear you had a wonderful time at the West of Haven for your birthday weekend. Such a great house with many personal touches. Definitely one of my favorites. Thank you for your booking and please visit us again. We really enjoyed this place and wish we could have stayed longer to simply relax. Because we spent so much time outdoors, it wasn't until the last night that we discovered some puzzles and how cozy it was to just hang around. The coffee provided was delicious and I appreciated the milk and sugar that was there on arrival. Sitting out in the backyard drinking coffee was great. Only downsides - the yard wasn't fenced and there were a lot of neighborhood dogs as well as a new kitten, so a bummer for our dogs who were confined to the porch. The house is more dog tolerant than dog friendly. Also, there is not an actual hike or path to the beach - it is close but driving was definitely the way to go. Other than that we loved the town and the cottage! Great place to stay. Thank you for enjoying the West of Haven and for having a relaxing time during your stay. West of Haven is definitely a cozy home to relax and be with the family. Thank you for mentioning the neighbor dogs, maybe we can determine where they live and speak to the homeowners, as well. Again, thank you for booking with us, and we hope you will visit us again; we have several homes that are pet friendly for those who love to travel with their furry friends. Yes, the name is actually West of Haven but “rest” is one of its beautiful virtues. Even though it has neighbors and houses border nearly every side of the property, it is quiet. The house is situated on about an acre of yard, and every inch is lush, green, and loved. The tree canopy provides cover, the landscaping offers a cushion, and discrete wooden fencing creates privacy. But the green space is the most appealing part of the location. All kinds of life flourishes in this haven. In the early morning, we drank our coffee outdoors while hummingbirds drank in the fushia. On the second night, close to dusk, we discovered a small fox sitting on the deck, looking into our well-lighted glass-paned door. He withdrew quickly when he realized he’d been seen. Every day, after a quiet spring rain, the sun came out and the garden seemed to bloom in several new spots. It was pure pleasure to snip flat-leafed parsley, a bit of rosemary, or some celery leaf for our home-cooked meals. Wood and glass, greenery and air. The interior of the house melts into the outside yard, day and night. We enjoyed the full moon, the bright stars, the afternoon sun, and the solace of rain. Here’s the bottom line for us as temporary tenants: The kind of care given this home is visible inside as well as out. Even though pet friendly, the house is immaculate. Every detail is attended to and clearly the owners are responsive to prior reviews. Not to sound too much like Goldilocks, but the beds were just right (if not even a tad bit too soft), and food and drinks awaited our arrival. And for readers who can’t accept an all-positive review: As older women we did struggle a bit climbing in and out of the claw footed tub/shower, but that inconvenience was compensated with long, peaceful soaks in a delightful bath. Quiet. Green. Well stocked. Clean. We found everything we needed here, and we left healed. Thank you Susan, for such a descriptive review of your stay at the West of Haven. We love this home, and for those who appreciate it, it is a beautiful place to be and rest. I am so tickled to hear you saw a little fox. I have yet to see one there. Yes, nature is everywhere there and to be taken in. Thank you for your recent booking and I do hope you will get to come visit us again soon. Super stylish little cabin with beautiful backyard in an a tranquil setting. Country / classic decorations in a suite that feels much larger than it is! Friendly hosts. Highly recommended! Thank you Robert, for your review of West of Haven and for staying with us over the busy weekend. I thoroughly enjoyed our experience at West of Haven. Such a beautiful home. I love how we were secluded but still not too far from town or the beach. Thank you for opening your lovely home to us and to our dogs. So glad we were able to accommodate you and your pets for your vacation. West of Haven is beautiful secluded home, just far enough away to have privacy, but close enough to have your needs met in town or at the beach. Thank you for booking with Redwood Coast Vacation Rentals, we hope you will visit again soon! Quite a unique house! We enjoyed our stay here. I can see it would be an awesome place for a family or 2 couples to stay, too. The feel is definitely eclectic, fits into the whole feel of the greater Arcata area. Our one less than perfect thing is that the bedrooms were small and the mattresses were quite firm. For us, not a very homey feel, for others that could be ideal. This was more than overshadowed by the prompt response by the management team when we locked ourselves out of the house!! They were awesome!!! And, the piano was FANTASTIC, including the songbooks there to help with playing and singing along. I recommend shopping in Arcata before getting to the house. There are a couple of great stores there, the North Coast Co-op, and Wildberries Market are awesome. And, don't miss the organic restaurant,Wildflower Cafe. Delicious!!! All in all, this is a well managed house available for vacation travelers. Thank you for the wonderful review of the West of Haven. You are right, this is quite the eclectic home, it is very unique. It sounds like you stopped at some great stores, as well. As I do frequent those establishments, I have to say that Wildberries juice bar is my go to stop for a smoothie (just FYI if you return again). Thank you again for staying with Redwood Coast Vacation Rentals. I do hope you get a chance to visit us again, maybe in one of our other homes for a little change. We celebrated our 10th anniversary in the Redwoods and West of Haven was a beautiful, comfortable, quiet and wonderful place to stay. We stayed there from October 18 to 24, 1015. Very artistic home set amid old growth redwoods, clean and well managed. Depending upon stops it is a 4 1/2 to 7 hour drive from San Francisco, but well worth it. Plenty of local restaurants and grocery stores nearby. We arrived at the house around 7 PM and my only suggestion is that they should have had some snacks and drinks on hand for people like us who arrive before going to a grocery store. They had their own blend of coffee which was great, so Dori if you know their secret blend email it to us please. Happy Anniversary and thank you for spending it with Redwood Coast Vacation Rentals, at the West of Haven. 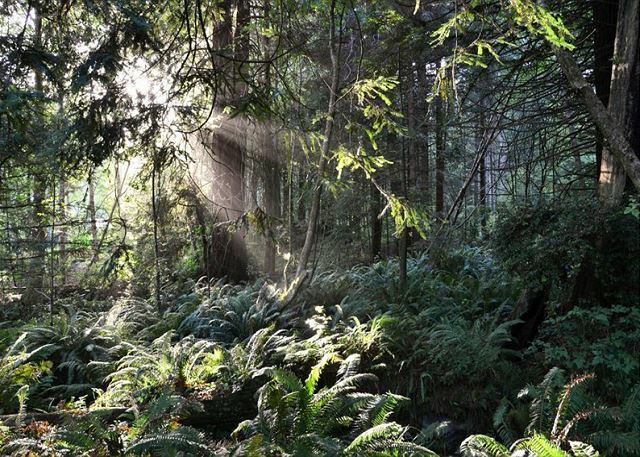 What a beautiful place to relax and celebrate, right in the redwoods. I will try to work my magic and see if I can learn what the coffee blend is, for you ;) Once again, thank you for your recent stay. Please visit us again soon. Great for families, beautiful surroundings. 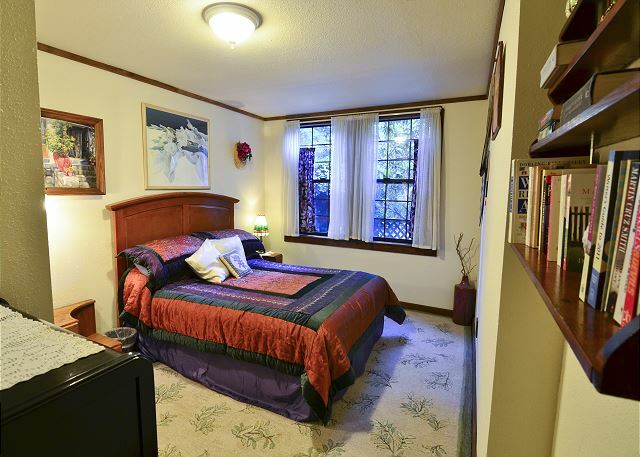 The property is very green and lush with gardens, ferns and redwoods. Our children loved walking around to explore. It was fenced in which made us comfortable letting the kids play outside, too. The house is full of of fun artwork and we could tell that an artist must own it. Everything was very clean and it was fully stocked with anything you would need to cook. We would love to stay there again. We would love to have you back! Thank you for your stay at the West of Haven. I, too, love the gardens, ferns and redwoods. The owners of the home are quite artistic and it is definitely reflected in the house. Thank you again for your stay and we at Redwood Coast Vacation Rentals hope you will return to visit again. Amazing is the only word to describe this place! Our family loved this rental and it was so far above a hotel or motel that words won't do it justice. The location was perfect for exploring the redwoods and the beaches in northern California. All and all I would give this place 10 stars our of 5! You just made me smile so big! Thank you for sharing your review of West of Haven. Redwood Coast Vacation Rentals thanks you for your stay and I hope you will return to stay with us again on another trip to the scenic north coast. West of Haven is truly a little piece of heaven in tucked away amidst the Redwoods. Thank you Francis, for the review of West of Haven.This is such a unique place, I love it when someone truly appreciates it. Thank you for booking with us and Redwood Coast Vacation Rentals hopes you come back to visit again soon! Unique pleasant home. Well stocked, clean and comfy. Owners were very nice. Thank you for the review of West of Haven. It s a very unique and comfy home. Please visit us again! We stayed a week in West of Haven. The place was completely furnished. The owners are upstairs and when we needed some wi-fi help they were quick to respond but otherwise left us to ourselves. The unit was comfortable and well maintained. We liked it and recommend it. West of Haven is such a unique property, I am glad you had a lovely stay there. The owners are quite nice and they take much pride and care in their home. 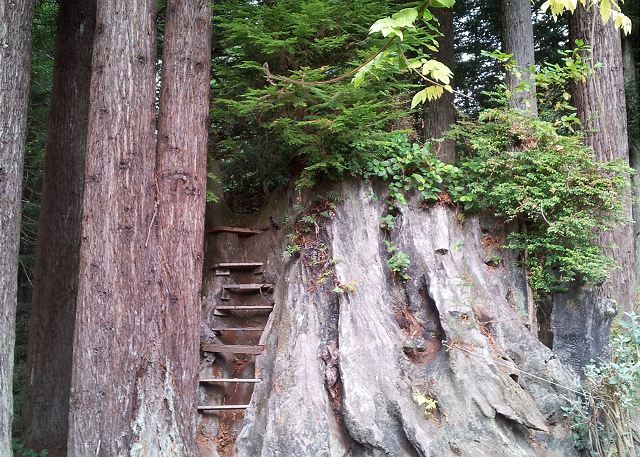 I do hope you will get the chance to visit our beautiful area again and stay with Redwood Coast Vacation Rentals again. We do have over 60 homes in quite varying environments if you want to try something different. Otherwise, thank you for your stay. My wife, son and I spent 3 days in this house and it was perfect. Very close to the Redwoods National Park and the house had everything we needed. It is in a very beautiful area and the house and grounds were very nicely decorated and kept up. I would recommend this property! Glad you had such a great time while staying at the West of Haven. It is great place. It may be off the beaten path, but it isn't far from the redwoods, town, and the beaches. Redwood Coast Vacation Rentals thanks you for your stay and we hope you will get a chance to stay with us again. Charming home, beautiful landscaped yard. Close to ocean and town. Directions were easy to follow and even though it's in a neighborhood, it is secluded and quiet. We loved our stay and would definitely book again. Thanks, Lareen, for the review of the West of Haven. This charming home is such a treat for those who appreciate the beauty it has to offer. So glad you enjoyed the home, seclusion, and beautiful yard. Redwood Coast Vacation Rentals is so pleased you loved your stay and we cannot wait to have you back again! Beautiful house and grounds. Very comfortable and serene. Fruit trees and vegetables everywhere. I think the only issue I had was the bedrooms were not as nice as the rest of the house. West of Haven is a lovely little home. I am sorry to hear that you didn't feel the bedrooms were as nice as the rest of the house. The living room furniture is much newer and the bedrooms are inf fact antique. The homeowners really enjoy the beautiful antique designs you will find throughout the home, as it does blend in with the artistic flair of their nature. Redwood Coast Vacation Rentals does have over 60 homes, and based on your desired taste, we would be happy to assist you with future accommodations to match your style. Thank you again for your recent stay, and we do hope you will return to visit us again soon. We had a wonderful stay at West of Haven. The pictures can't capture how truly lovely it is. My children played for hours in the beautiful back yard and my husband and I enjoyed many nice glasses of wine on the back patio. We truly enjoyed our stay. I love that you say you had a magical stay at the West of Haven. The wooded and floral environment always made me feel that way. Thank you for renting with Redwood Coast Vacation Rentals, and we hope you will return to stay with us again! We had a great time. 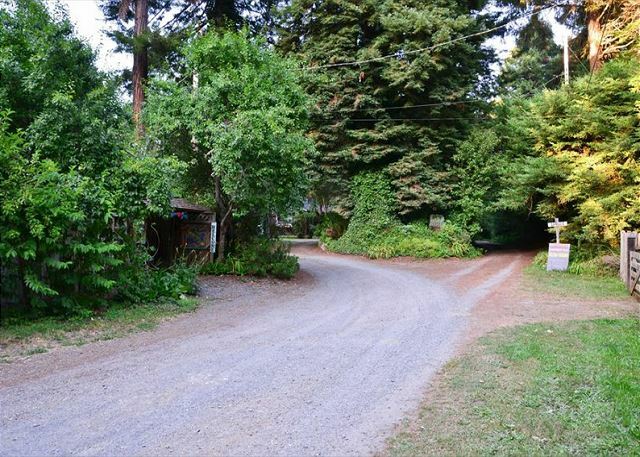 West of Haven is a very artsy, spacious home nestled in the redwoods. The rental is immaculate and well appointed, the garden is awesome, and the hosts Ottavio and Kahish are great. We'll be back! What a fun weekend to be in our area! Thank you for your review of West of Haven. I hope you will get a chance to stay with Redwood Coast Vacation Rentals again, soon. Beautiful Property- Didn't want to leave to go site seeing! The property is everything it says it would be. We had a wonderful stay and experience on this unique property. I believe there is no other house like it in the area or that would even come close to the beauty. I would recommend this house to anyone wanting to experience an adventure and loves the outdoors. We would stay here again for sure. So glad you loved this home! It is a very unique place and I am particularly fond of West of Haven, myself. I hope you will get a chance to visit us again for a little more relaxation at the home and a bit of site seeing, too. This was truly a home - and filled with character, personality, very interesting. West of Haven truly has character and personality! Redwood Coast Vacation Rentals thanks you for your recent stay. Beautiful quite area set in the Redwoods next to Trinidad. This is not a place to party its a place to enjoy nature. Thanks to the family for allowing me to stay here at a reasonable price in a nice location. Also the property mgt company was real helpful. lastly, do not leave a mess and you will get your cleaning fee back. Thanks Harry, for the review of West of Haven. This is a beautiful property to enjoy. Thank you for your stay and I hope you will return to Redwood Coast Vacation Rentals again. We had a delightful experience as a family in the West of Haven rental. The only thing we would have wished for would be a dishwasher, but we had fun doing the dishes by hand. The grounds were wonderful for my grandchildren. The 3 children from LA were especially entranced by the magnificent redwoods and the creek that ran through the property. Thank you for the review of West of Haven. It really is a delightful place to stay. 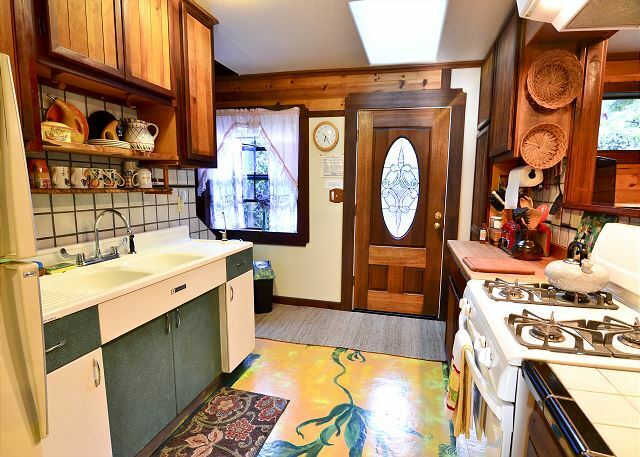 A dishwasher would be great, but the cozy kitchen does not allow enough space. I will pass on the recommendation, though. For those not used to the wooded environment, the grounds are such a treat! It can be quite a change for most. We do hope you will get a chance to stay again. Thank you for staying with Redwood Coast Vacation Rentals. My daughter, and myself, and my daughters dog were very comfortable in this place.Everything you need for a home away from home. Very nice! Would recommend and would definitely stay there again. Thank you for the review of West of Haven. 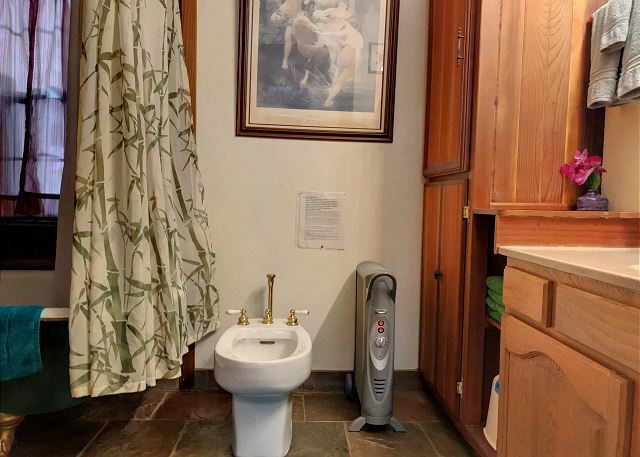 I am glad to hear you had a comfortable stay in this cozy rental in the forest. Would love to have you stay with us again, here with Redwood Coast Vacation Rentals, and enjoy our beautiful North Coast. a beautiful,comfortable home. very cozy, excellent yard. enjoyed all the artistic accents. had a wonderful thanksgiving feast with family. Glad to hear you had a wonderful Thanksgiving while staying at the West of Haven. I hope you will have a chance to visit us again on another occassion, here at Redwood Coast Vacation Rentals. 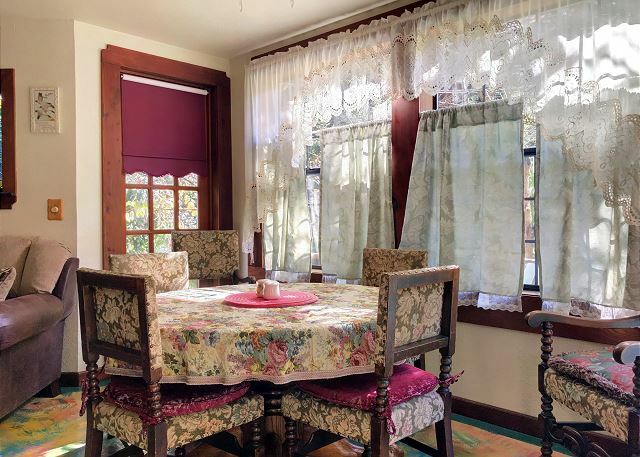 Redwoods surround this charming cottage with a beautiful garden. 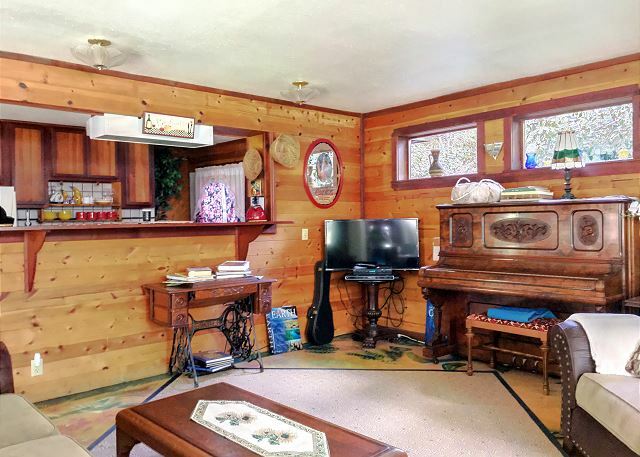 The cottage has an early 1900s feel, but all the amenities including a very well equipped kitchen, comfortable living room, two nice bedrooms and even a piano! Thank you for appreciating West of Haven. One of the main allures to this home is the location and the wonderful gardens. The antique furniture is a nice touch for those who see it for what it is. We do hope you will return to visit us again! We had a very relaxing, enjoyable stay. The property was very nice. The owners were friendly and gracious. We will definitely stay here again. West of Haven is a wonderful off the beaten path place to stay. I am so glad that you had a relaxing and enjoyable time while there. We do hope you will return to visit us again. This was the best experience of all our rentals during our tour of the Ca. and or. coast. The owners made us feel very welcome, even asking us to join them for an impromptu supper with their friends and family. Can't express how nice it was to have a chance to meet and chat with folks who love where they are and what they do. Outstanding accomodations and hospitality. Our experience was beyond our expectations. The house is as beautiful inside as it shows on the outside. We highly recommend this as a retreat for those who need to relax and enjoy it's serenity. Thank you, Karyn, for the wonderful review of West of Haven. We love this home as much as you do. Thank you for your recent stay and come visit us again! This was a magnificent home tucked away in the beautiful forest. This is an original cabin that was upgraded and kept up with every option you can think of. the full kitchen also offers many basic kitchen ware and baking needs. With this being just minutes away from the beach and giant redwoods the location was perfect. The landscaping was kept up and had more to offer than a weekend could allow to experience. The owners are very accommodating and personable, they will make sure your experience will last forever. What a great review of West of Haven! Thank you for your choosing this home for your Trinidad visit. I hope you will make it back to visit again. Thanks for the review of West of Haven. I love this home, off the beaten path and in the environment that it is in. I am pleased you enjoyed your stay while visiting the north coast. Please visit Redwood Coast Vacation Rentals again! It was beautifully decorated with everything we needed. We loved staying here and would love to come back. We would love to have you come back! Thank you for recent stay at West of Haven. It was difficult to find in the dark of night in the pouring rain, but the property manager was available to us and was there within 5 minutes to guide us to the property. We felt she went above and beyond for us, even brought us candles in case we lost power in the storm. It was the perfect weekend retreat. Absolutely beautiful. We will go back and stay longer next time. Thank you for the review of West of Haven. It was a pleasure to help you out in the dark and stormy night. I am pleased to hear you had a perfect weekend retreat and I hope you will return to visit us again. Overall a positive experience. Unique look and feel to the residence and grounds. Comfortable sofa upgrade would be a plus. The yard had a "secret garden" quality to it and we enjoyed our time out there. The owner has done a great job with artwork and floor paintings. Thank you for the review of West of Haven. This home has a very unique feel to it, and I love your description of "secret garden", I will have to agree with that. Thank you for the recommendation of the sofa, I will definitely pass that on to the homeowners. This is one of the unique properties that we have that is nestled away, off the beaten path, in the woods. I do hope you will return to Redwood Coast Vacation Rentals and look at one of our other 50 properties for another experience of our north coast. Thank you for your stay, I do hope you will return again. Thank you for the review of West of Haven. It is definitely a special place. Maybe next time you will be able to stay a little longer! Our visit coincided with Northern California's first big storm in awhile, so we spent a lot of time inside. We were delighted to have a place that felt so comfortable and cozy. Enjoyed the covered portion of the deck where we could sit outside and enjoy the rain and croaking frogs. The kitchen was well stocked, bathroom had lots of thick towels, wifi and TV worked fine. My dog loved the big yard. The place had a very artsy feel both inside and out. Would be happy to return one day, perchance to see the sun. West of Haven is definitely a cozy home to have to spend time in. I do enjoy the yard and porch there very much, too, and in this home it is hard not to feel comfortable if you have an artistic nature. We would love to have you return, hopefully during a sunnier time. Have you considered the late fall, tends to be sunny then. Here at Redwood coast Vacation Rentals, we have over 50 vacation homes along the north coast with very varying environments, some that take dogs as well, so please keep us in mind for your next trip. We had Avery good feeling about our stay. But we felt that we left the house in the same spotless condition as we found it but did not get our deposit returned. Thank you for the review of West of Haven. I am pleased you had a very good stay and you did leave the place in great condition, thank you. I hope that our reservationist has contacted you to let you know we did not take a deposit, and that she was able to further help review your booking. Please come visit us again here at Redwood Coast Vacation Rentals. We have over 50 vacation homes in quite varying environments and locations along the north coast, that you may also find quite enjoyable. We would love to have you return. The yard is lush and green with a variety of plants, trees and shrubs. The owners were friendly and welcoming.The home is uniquely decorated and is well supplied. Thanks, Jolene, for the review of West of Haven. This is a fun home which really reflects the artistic nature of the homeowners. They are very colorful and friendly folks. I hope you will visit us again at Redwood Coast Vacation Rentals! in general a nice experiance. Overall a nice stay, the living area's were very clean and nice size for the two of us. The grounds and flower gardens were in good condition and a nice area to sit and relax. Early spring time would look great in the flower gardens, and also enjoyed the frsh cut flowers and seeing the massive stump (huge) of a giant Redwood tree. 1. Place added breakfast as an extra on website. We probably would have went but did not read about this service until to late. 2. Parking should be closer. Walking on the sidewalks after dark is pitch black, solar lights would help. 3. Window shades in master bedroom to block out light. 4. Fire pits are really popular and West Haven would be a great spot to enjoy a nice glass of wine while relaxing around a fire at night. The accomodations were lovely. The owners were lovely. Tenants needs could be taken into account more. Paper towels and toilet paper should be supplied for the duration of the visit given the cost. We loved the home and were completly relaxed there. Hope to visit again. Beautiful and unusual location. The house itself and garden belongs to a very creative couple and it shows. We were in Trinidad for a Wedding Rock weddng (our daughter) and had several imprompto "showings" of the house & garden--raves all around.